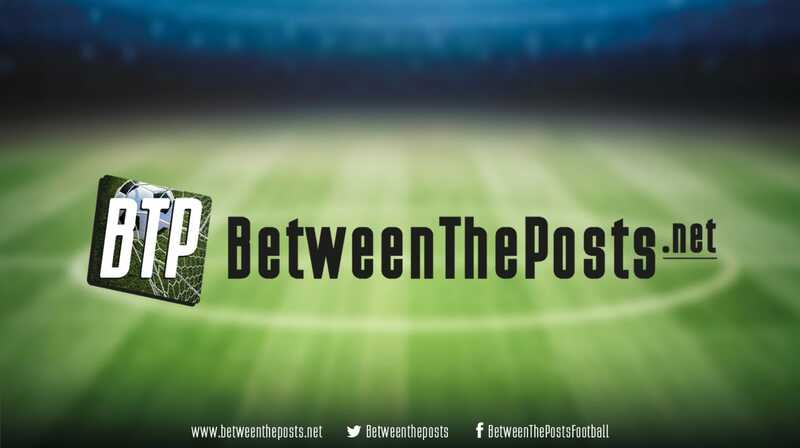 Between the Posts weekend preview: a look at the games we will cover this weekend. 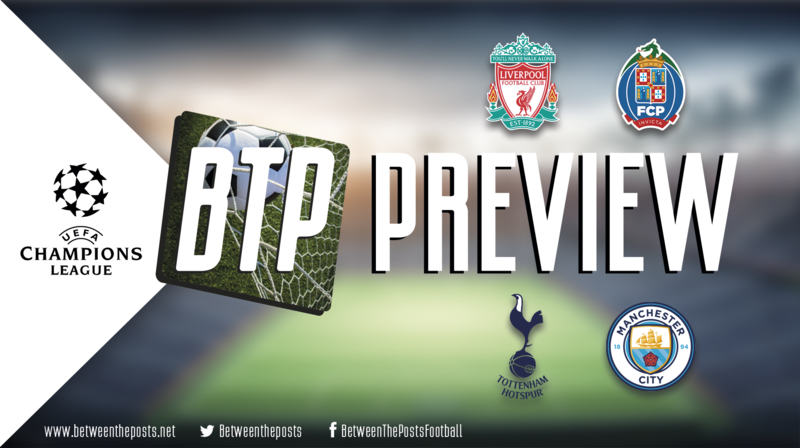 Welcome to the weekend primer of Between the Posts. In this article, you can find out which games are going to be featured as tactical analysis on our site during the weekend, including a little preview of these matches. Both these teams have an abundance of young and talented players, but both have also been struggling to string together a coherent team that wins matches. Stuttgart has been alternating between formations with four defenders and five defenders. Their talent department holds Pablo Maffeo (21), Borna Sosa (20, currently injured), Benjamin Pavard (22) and Timo Baumgartl (22). The thing is, the goals have been coming at Stuttgart fast, as they have already conceded 24 goals in 11 matches (only Fortuna Düsseldorf has conceded more). 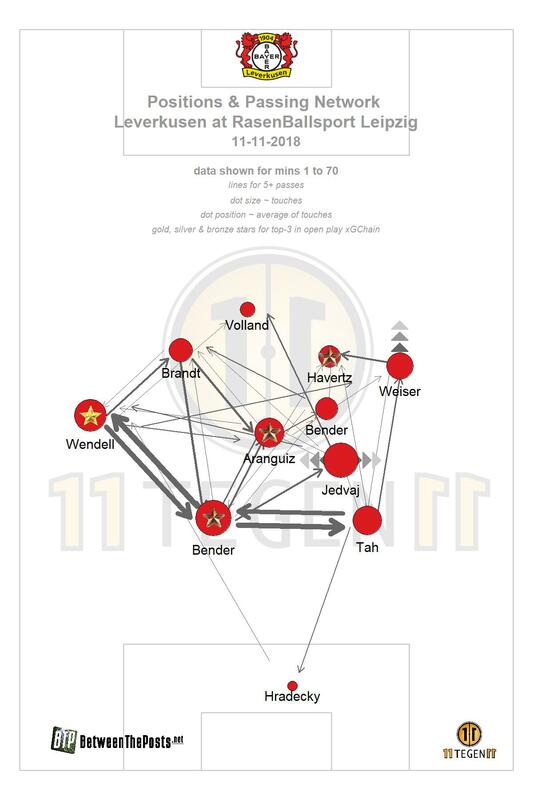 At Bayer Leverkusen, the talented payers have an even better-known profile, as Julian Brandt (22), Leon Bailey (21, Jonathan Tah (22) and Kai Haverts (19) will likely feature in this game. Even though Leverkusen are currently thirteenth in the Bundesliga, this crop of talented players makes this a game you should watch if you are at home on your Friday night. Tactical analysis to be written by Max Bergmann. Under new manager Santiago Solari, Real Madrid have shown a slightly different brand of football than under his predecessor Julen Lopetegui. Solari likes swift, high-tempo play with traditional wingers who can provide lots of crosses. 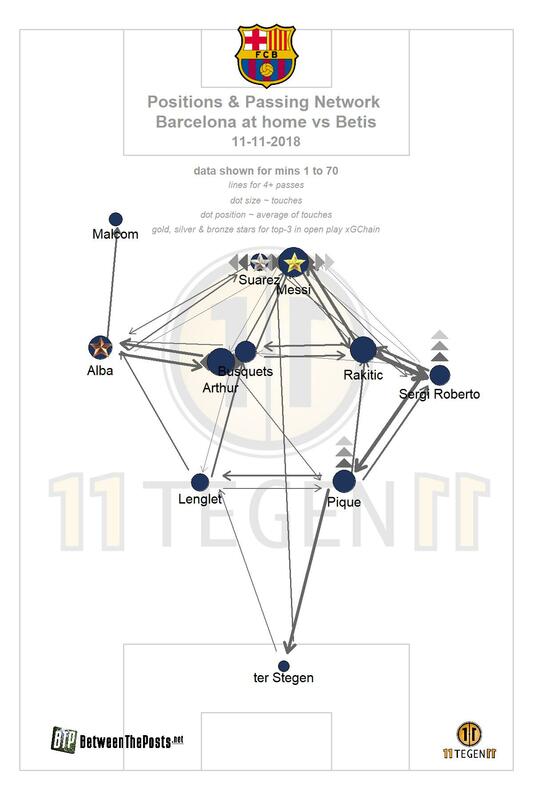 It seems like under his reign, Real Madrid are less concerned with the structure in midfield, though, and their pressing is not as intense as under Lopetegui. Since the go-to style for most European top clubs now involves some form of pressing and / or counterpressing, it is interesting to keep an eye on what Real Madrid do without the ball. Eibar have grown into one of LaLiga’s familiar faces over the last five seasons. They won promotion in 2014 and broke a club record by finishing in ninth place last season. Eibar play a direct 4-4-2 formation and are not afraid to press higher up the pitch incidentally, which likely makes this match a very interesting tactical battle. Tactical analysis to be written by Martyn Davis. Eibar’s clear 4-4-2 structure, with deeper central midfielders and more advanced wide players. It is almost December and three teams in the Premier League are still unbeaten. Manchester City and Liverpool have both gone through developmental seasons under new managers, and are now reaping the benefits with clear playing styles and excellent results. Chelsea, meanwhile, are the other unbeaten team, and they are doing so in Sarri’s first year at the club. A remarkable feat that will undergo a severe test as Sarri’s high intensity passing team will come to visit Wembley. Tottenham Hotspur are known for their intense pressing game under Mauricio Pochettino. After a remarkably quiet transfer window, they see many of their star players struggle with form and fitness issues. Despite that, they’re stil only a point behind Chelsea in fourth place. Tactical analysis to be written by Sam Planting. 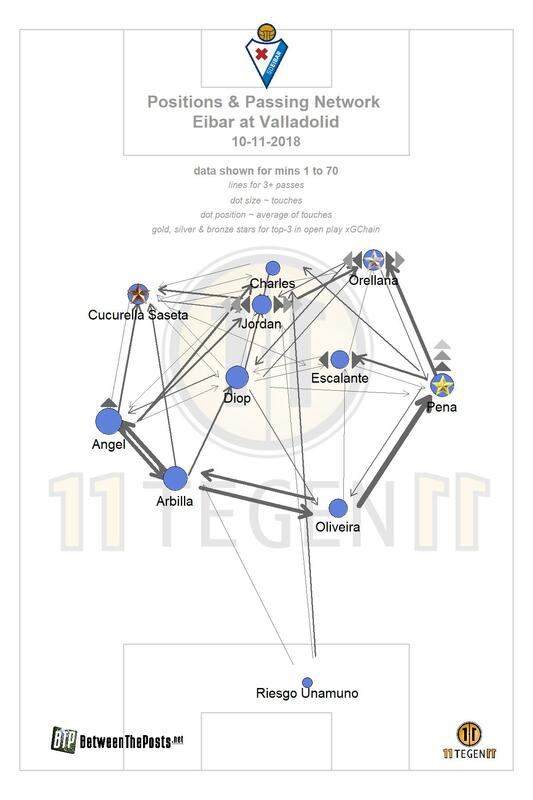 A typical Sarri pattern, with a cluster of short passes from the left halfspace. Atlético and Barcelona go into this match as third and first placed teams in LaLiga’s table. While this suggests business as usual for both clubs, the truth is rather different. Atlético have massive offensive issues, and going into this weekend their offensive numbers have been downright poor. Fourteen teams have created more expected goals than Atlético. Their current results have been fueled by extremely efficient conversion on the offensive end of the pitch. Anyone familiar with expected goals will know that theses waves of efficient conversion are not likely to hold, so a dip in results would not be surprising, unless underlying numbers can improve. Barcelona, meanwhile, haven’t been smooth sailing themselves this season. We are twelve matches into this LaLiga season and just five teams have conceded more goals than Barcelona’s eighteen. In other words, Barcelona is conceding goals at twice the rate of last season, where they finished with 29 conceded in 38 matches. Knowing that Real Madrid are – were? – in a crisis of their own, at the very least this means we are in for an eventful LaLiga season. And for this weekend this means both Atlético and Barcelona will feel the pressure to avoid a drop of points. Tactical analysis to be written by José Perez. Every season has its high rising teams at this point in time. With roughly a third of the season played, sample sizes are still rather small and you will likely encounter some teams in unfamiliar positions due to sheer under- or overperformance. Some lucky bounces, some injuries here or there, the fixture list, all of these factors can make a significant difference at this stage. It is easy to reflexively stamp this explanation on high flying Bournemouth right now. But this would probably be wrong on several accounts. Their underlying numbers are mostly in line with their excellent results, with most of their excellent offense relying on elite shots creation off set pieces. Arsenal were always going to be in transition, having finally entered the post-Wenger era. Unai Emery is still struggling to find the balance in his side, at times producing free flowing offense, but at the costs of defensive frailty. At other times, the team looks defensively sound, but fails to break deeper opponents down. An interesting clash awaits us between two teams that will slowly but surely reveal their true colors over the course of this season. Tactical analysis to be written by Neill Barclay. These two teams are set out to qualify for Champions League football after missing out last season. Lazio finished in fifth place on equal points with Internazionale, while Milan finished in sixth place, eight points off their arch rivals. Roma’s issues so far have opened up space in the top four, though in reality not much separates Roma, Lazio and Milan at the moment. Just prior to the international break, Milan badly fell short against Juventus, losing the shamelessly red-carded Higuain in the process. Earlier this season, Suso’s individual brilliance had papered over a lot of tactical cracks in Gattuso’s side, but even his skill couldn’t rescue some form of performance against Juve’s dominance. 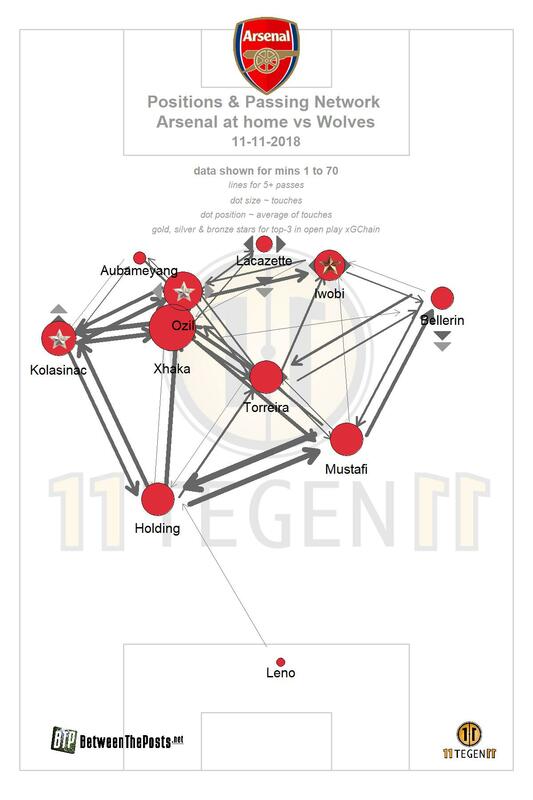 It remains to be seen how Gattuso adjusts to the absence of Higuain on a smaller scale, and how both managers deal with their team’s poor shot creation on a wider scale. Tactical analysis to be written by Josh Williams. 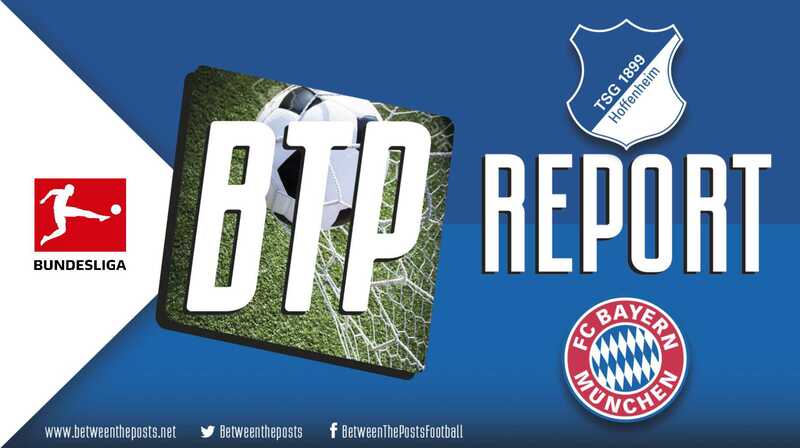 These two underperforming sides are not the usual suspects in a Between the Posts match report. Still, a Monday night clash between two teams with struggles of their own should provide a tasty affair. After years of promising high mid table LaLiga finishes, Real Sociedad disappointed with last season’s twelfth place finish. Currently, La Real are still struggling to do better. Numbers-wise, Real Sociedad’s struggle have clear been on the offensive end, as the team created the lowest number of shots in the league. A reasonable shot quality and some offensive overperformance still kept them more or less afloat. Celta de Vigo fans had reasons for optimism going into this season. Expectations were high under new manager Antonio Mohamed, recruited from Mexican side Monterrey. His tenure, however, would come to a stop just twelve matches into the LaLiga season, with the club winning just seven points in their last nine LaLiga matches. In came Portuguese manager Miguel Cardoso, fresh off a disappointing affair with Nantes, but prior to that having made name for himself by guiding Rio Ave to a fifth place in Portugal, ensuring European qualification. Cardoso is known for his press-and-possess style of football and, as such, may be a very nice fit with the current Celta de Vigo squad. Tactical analysis to be written by Chris Baker.